Designed for warehouse storage, Flow-Rite Inc., supplies, installs and supports Industrial Shelving products of the highest quality in Toronto and Southern Ontario. Our solutions allows warehouse inventory to be stored more efficiently by providing organization and increased warehouse storage density. We offer a wide variety of bolted shelving, boltless shelving and wide span shelving that provides highly technical solutions to the most common industrial shelving problems, such as rapid assembly, extreme stability, strength and high cost efficiency. Industrial shelving is generally constructed of metal components which create a multi-level shelf system that can support a wide range of materials both in size and in weight. The thicker the metal, the more weight the shelving can bear. 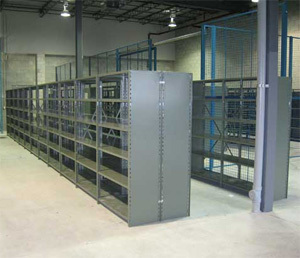 Flow-Rite Inc., will analyze your needs to determine what type of Industrial Shelving is right for you.